What a surprise it was to welcome this little man into our lives a week early. I was so sure that I would be carrying him well into February, but nature stepped in and I gave birth to our little man exactly one week before his January 25th due date. From the second I got into the car for the long ride back to Toronto, my contractions were right on top of each other. I timed them for the entire ride. Some were over 3 minutes apart, but most were 2 minutes apart lasting over a minute each the whole ride, which took over an hour. There was a LOT of throwing up going on because of the pain and thankfully we had plastic bags. Red lights became a dumping ground for them. When we got to the hospital Kathleen was waiting and we got into a room right away. I mistakenly thought I would find relief when we got there, but that notion evaporated in a mere second when I realized that I was completely naive! Contractions don’t care when you arrive at the hospital. They’re going to keep getting stronger no matter what. All modesty went right out the window when we got into the room, for the clothes came off. So much for all that time spent contemplating about what I was going to wear during labour. At that point I didn’t care who was in the room and I didn’t care that the door was wide open. Kathleen checked my progress and I was already 8 cm dilated. I was squatting through contractions totally stark naked in clear view of the open door. Contractions kept coming on top of each other and I was in every position imaginable. I went from squatting on the floor to being on all fours on the bed with my face buried in the pillow and rolling over in between. At the height of every contraction, Yuri pressed on my back, Kathleen pressed on my feet, and they both reminded me to breathe and relax. I remember screaming things like “faaaaacccccckkkkkkk,” and “my back, my back, my back!” whenever Yuri didn’t have his hand there, and “I can’t do this, I can’t do this anymore.” The pain still brings tears to my eyes, and I’m still adamant that Oscar will be an only child. At some point Kathleen asked if I wanted to get in the shower, and though I was mostly focusing inward and was outwardly quite delirious, I was all over that opportunity. With the hot water beating on my ridiculous back labour pains (Seriously? Why?) I actually got through 2 contractions without screaming. That’s when the baby started to descend, and I surprised myself with some interesting sounds. Transition. Kathleen had said she would be able to tell when the baby descended. I knew what she meant now. In 4 of the most intense contractions yet, our little guy moved down and I felt the need to push, breaking my water on the second try. That’s when my midwife said “no babies in the shower” and I laughed somewhere deep inside. Awkwardly I was led back to the room scantily clad with my hospital gown thrown over my shoulders and Yuri and Kathleen on either side. Somewhere between the shower and the bed, I heard Kathleen tell Yuri that it would be 1-2 hours of pushing. That’s when I cracked inside and decided there was no way I could last that long. Once I was back on the bed and screaming “I can’t do this” once again, Kathleen explained how to take my breathe and use it as a push rather than a scream. Wow, did it ever burn! I think it only took 3 contractions after that priceless piece of information reached my ears before our baby boy flew out. And I mean FLEW. It had only been 10 minutes since we had returned from the shower. I turned purple for those 3 pushes. I could feel my colour change. For one reason or another I never once asked for pain medication. But a handful of times during contractions, especially near the end, I remember wishing they’d just go ahead and cut him out! What really got me through was the support of Kathleen and Yuri. I knew I could do it, and they kept reinforcing that notion, so I kept going. Though there really wasn’t another option, was there? The down side of the quick pushing was a 2nd degree tear and a nice fat hemorrhoid. Yep. Beautiful! I’m not shy about it. It happens! But at the time, I just wanted the baby out as fast as possible. Lesson learned. Push SLOWLY unless you want to tear. But boy, what a relief it was to get him out! At that point it was 1:42pm, not even 3 hours since we arrived at the hospital, and there was a baby on my chest. I will never forget that moment. My face was priceless. It was a face full of shock and tears. At the end of it all, I had known that a baby would appear, but I really wasn’t prepared for that moment and I’m not entirely sure that anyone really can. We all cried. 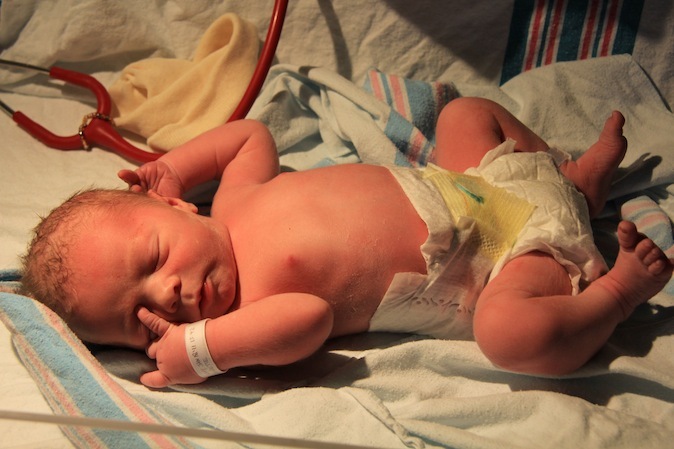 Kathleen, my primary midwife, had told us that the backup midwives never missed a birth. All I could think was, “she’s missing this one.” I was determined to push baby boy out in record time. As it went, the backup midwives arrived shortly after Oscar was born. When they got there, I think the door was still open. I was still naked and still not caring about it. Nursing for the first time. It took a long time to be stitched up which scared me a bit because I knew that the longer the stitching took, the worse the tear and the longer the recovery time. That, and Yuri said “It’s pretty bad.” Excellent. It has now been 3 weeks and I am feeling nearly whole again. I am hoping to get back to the gym soon and get some of the muscle back that I lost over the past 4-5 months. I thought I had lost all of my baby weight until I found the scale yesterday and weighed myself. It turns out that I just have massive breasts and they form the illusion of thinness. Works for me! I’ve got 12 more lbs to lose and I’m giving myself an entire 6 months to lose them. It took me 9 months to gain them, and I’m not going to kill myself trying to lose it fast. No pressure. Oscar gets checked out and weighed: 7lbs 1 oz. Although I remember labour as a traumatic experience, as you are now clearly aware, I am still happy that I did it naturally. If we have any more kids, I’ll do it again. Reluctantly that is. Hats off to women all over the world! Less chance of intervention from forceps and vacuum, not to mention c-section! Having gone through the experience, I cannot judge any woman for electing to have a c-section, nor can I judge a woman for having an epidural. I totally understand! My fears of complications due to modern medicine were far too great for me to do either, unless there were an emergency and baby had to come out ASAP. I wish I could have gotten the epidural, but I just couldn’t. Heading to the recovery room.